We’d love your help. 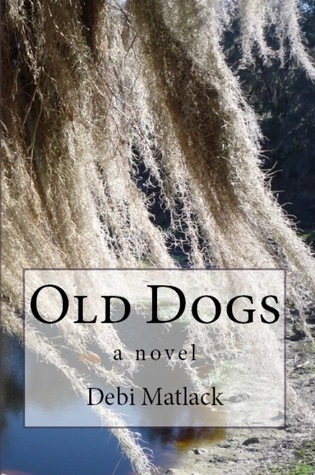 Let us know what’s wrong with this preview of Old Dogs by Debi Matlack. After a bitter divorce from her snobby, unfaithful husband leaves her with the dog and only enough possessions to fit in her Chevy Vega, Valerie Roark retreats to the dark water and pine woods of her Central Florida childhood. In spite of her overprotective and loving family's well-meaning efforts to draw her out, Valerie only wants to hide away and lick her wounds in priv After a bitter divorce from her snobby, unfaithful husband leaves her with the dog and only enough possessions to fit in her Chevy Vega, Valerie Roark retreats to the dark water and pine woods of her Central Florida childhood. In spite of her overprotective and loving family's well-meaning efforts to draw her out, Valerie only wants to hide away and lick her wounds in private. She's discovered a benefit to living a hermit's life: no one can stomp on your heart. She didn't expect to become friends with her new next door neighbor. To ask other readers questions about Old Dogs, please sign up. Loved..loved..loved this book. Debi draws you into the story and you don't want to leave. These characters are alive and the settings just pop with vision. It's a page-turner and when you done you want more. Debi Matlack is that oh-so-rare of creatures, a Florida Native and lifelong resident. Married to another Florida Native, she lives with him and four furry kids and, much like the main character in Old Dogs, she works for a veterinarian and loves music of all kinds.